In which form should the political solution be presented to the national question. How the innocent Tamil civilians and the LTTE should be looked into with regard to a settlement? Minister of Constitutional Affairs and National Integration D.E.W. Gunasekera: We have a history of missed and lost opportunities. After Mr. Bandaranaiake's and Mr. Dudley Senanayake's futile attempts, the next attempt was by Mr. J.R. Jayawardene trying to bring in the 13th amendment. At that time it was a step forward. President Jayawardene even with the 5/6th majority failed to implement it. It was implemented in other provinces but not in the North and East. But years later when President Premadasa, the successor was not in favour. Finally it was "thrown into the winds" and the whole country went for a war and, it still continues. Of course right throughout the LTTE was a stumbling block. 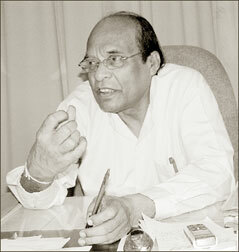 Dr. Neelan Thiruchelvam, who was the brain behind the federal constitution, was killed by the LTTE. He was the person, hitherto, took the most radical decision about a constitution. President Mahinda Rajapaksa had to find a solution which five of his predecessors failed. Absence of a conscience between the two major parties was the main obstacle. During the 'Samagi Peramuna' regime, Mrs. Sirimavo Bandaranaike while having talks with the Indian leaders on the Citizenship issue at every turn of the discussion telephoned from New Delhi to consult Mr. Dudley Senanayake, the then opposition leader for his opinion. The problem was solved and if it was not, the present situation would have got worse. Those prove the point that a conscience, at least, among the two major parties is essential. The solution, President Rajapaksa gave, at least makes an attempt to implement what is legally elected. At the present state of political development this seems inadequate. But until the APRC's in a position to arrive at a solution President brought in the issue. The Eastern Province can not remain unattended. The benefits of the 13th Amendment have not reach the North and the Eastern Provinces. Tamil National Alliance MP Suresh Premachandran: A separate State is actually not the wish of the Tamil people but actions taken by the successive Governments in the past pushed the Tamil people towards this decision. If the present Government can forward a perfect alternative fulfilling the aspirations of the Tamil populace, the national problem can be solved. TNA is still supporting a federal state. If the government is ready to dissolve power in a rightful manner this can be solved. If the Government continues to stress on a solution within a unitary Constitution it will not incorporate Tamil aspirations. The actual solution should be for the Tamil people. If the problem is addressed in a proper manner I believe the LTTE will also fall in line. If the then Government had solved the problem when late Mr. Chelvanayakam and his party raised the issue of a federal state, there wouldn't be a LTTE now. Now it is the LTTE, previously it was PLOTE, EPRLF or EPDP. LTTE is not created by the Tamil people but by the successive governments. So the problem Tamil people are facing now and the LTTE cannot be separated. If the aspirations of the Tamil populace are met then there is no need of weapons. Tamil leaders were extending their fullest support to bring solutions to the grievances of the Tamil people since independence. Therefore, after the failure of several efforts by Tamil leaders, late Mr. Chelvanayakam declared in 1976 that there can be no alternative but to consider a separate homeland. He was following a non-violent path. But the then youngsters thought this non-violent path will be unsuccessful as there were several prior instances where the Tamil non-violent movements were thwarted by the Government Military. Despite the tougher approach taken against the LTTE, the outfit is also constantly invited to enter into negotiations. So how is the LTTE identified in the ethnic question? D.E.W. Gunasekera: I do not think that the LTTE have changed their position still. May be, in the future, Sometimes if a new leader emerges the situation might change. But, Prabhakaran has proved by life and history to be tough man insisting on an Eelam project. It is said that he has told his close colleagues that the day he gives up Eelam he is ready to sacrifice his life. He is a belligerent rascal. He thinks that violence is the only method to win. Peace talks and negotiations are compliances for them to strengthen. They exploit the opportunity again to take a step forward. LTTE is not ready to give up Eelam and not even to opt into an alternative solution. This time, they have no reason to oppose. And now they turn around and say nothing less than a federal system. I do not believe that LTTE is a liberation movement. There is a difference between terrorists and a liberation movement. The whole African continent was liberated through a struggle, at times arms struggle, but they did not kill innocent people. A liberation movement gains a lot of public support. Not the LTTE. The fact remains that the two main parties account for 85% of the 'vote bank' of the country. The moment the Sri Lanka Freedom Party and the United National Party agree to a consensus, as I believe, it will totally change the political landscape. It will bring pressure on the process and gain confidence of the moderate Tamil speaking people. It can even put pressure on other political parties to come to an agreement. Many Tamil speaking people want to live peacefully in the country and are not much bothered about political interests. Suresh Premachandran: Many Sinhala politicians in the government think that LTTE will not come for a dialogue and that they are not ready to solve the problem in a unitary Sri Lanka. That is not correct. LTTE is a party who gave a written proposal to the Sri Lankan Government - the Interim Self Governing Authority (ISGA) for the Northeast. ISGA demands were very high; I'm not denying it. But the LTTE was prepared to discuss. Yet the Government was not ready to discuss it. Then the P-TOMS proposals came up, when the JVP went to Courts and it became useless. The LTTE couldn't do anything. LTTE has given signals to solve this problem within a united country. In the name of eradicating terrorism civilians are getting killed daily. These are innocent Tamil people. So the war is not going to solve their problem. That is not the answer to the Tamil national question. I will not believe on the Government's preparedness for discussions. They have to create an atmosphere where they can start talks. It is a question of believing in what the Government says. If you are honest for a discussion then you have to create some sort of a suitable atmosphere. Then the international community and the local Tamil people can push the LTTE to come in for talks. If one thinks that the military strategies can bring about a final solution then democracy cannot be expected from either the LTTE or the Sri Lankan Government. How best the North and East crisis could be solved within a unitary State? D.E.W. Gunasekera: Well these words 'unitary' and 'federal' are terminologies that do not necessarily be given concentration. These are only methods through which the problems are solved. United Kingdom have four parliaments. Yet they call themselves a unitary country. But federal features are there. India, is called a federal state. But the President has all the powers to make it a unitary. So essentially it is not federal. If federalism is applied one can not take back the power. A political system for a country have evolved with the basis of its historical backgrounds. And you can not simply implant one model to a country that is fitted to another. In my opinion the federal system there is nothing to oppose. But things have changed so fast. What is important is how much power should be given and for whom to be given. If you decide on that, let it be called anything. Remember 61% of the Tamil people are living in areas outside the North and East and 29% of the total population speak Tamil. Suresh Premachandran: After the Indo-Lanka Accord, efforts were being made to solve the problem in a unitary country. Within a unitary state, devolution of power is not possible; Decentralization is possible. In decentralization powers given can be withdrawn at any time. Tamil people would prefer to have their own administration in their own areas as they can perform better that way. In many countries all over the world people are living peacefully in multi religious, multi lingual, multi cultural societies. Therefore, I see no chance for a solution within a unitary solution. We must go beyond the current vision. Radical changes must take place in the constitution. If you think that by giving powers to the Tamil people they will move away or part. That is utter rubbish. If you give enough power there is no need for separation. Just because the Tamil people want to live in their own culture and administration - it does not mean that there is no space for other communities. The administration can be arranged in such a format that everyone will be treated equally in every aspect. We are not for a monolingual state. What are the genuine grievances the Government thinks the Tamils face in the North and East? D.E.W. Gunasekera: The highest priority should be given to the language. That is why I think President Rajapaksa assigned me the ministerial subject of official languages which was under the Ministry of Public Administration previously. He thought that this is part of the national question. My first Cabinet paper to the first Cabinet of the present Government was on official languages and the 13th amendment. I emphasized that in the 13th Amendment the Tamil language becomes one of the official languages but it was never implemented. That is why we lost the confidence of the minorities. If this issue is not addressed the frontiers of war will be extended. Now we are in the process of implementing it. National integration can be achieved through language, culture, religion. This can create a whole new atmosphere in the society. For example there are many Tamil people residing near the Malwathu- Asgiri temple in Kandy. With the initiation of teaching Tamil the whole environment of the neighbourhood has changed. The gap between the communities should be bridged before it gets wider. Suresh Premachandran: There is a war going on for the last 30 years. It is not simple and not for fun. They are fighting for a cause. In the Tamil dominated areas, specially in the North and East, the economic development, education aspects were deprived. Sinhalese were colonized in areas where majority were Tamil people. I am not denying the fact that Tamil people moving into Sinhala dominant areas or Sinhala people moving into Tamil dominant areas. There should not be any restriction. But I am pointing at instances where the Government purposely brought in Sinhala people from villages down south and made them settle down in Tamil dominant areas, making the Tamils a minority. Tamil people lost their parliamentary seats in these areas and became minorities in their original lands. We have to score more marks to enter universities. Learning Sinhala language was made compulsory for us to get educated. So, that is why we tell the Government that if they are not ready to incorporate us, then let us carry on separately. If yes, give us the necessary powers to function. But enough is enough. We should go forward for a solution. Does not every citizen encounter grievances in their day to day lives, be it Sinhala, Tamil, Muslim, Burgher, Moor or Malay? Or are those unique to the Tamil populace? D.E.W. Gunasekera: There are common grievances, whether Tamil or Sinhala or of any other ethnicity were problems common to all. But there are certain problems that arise because they being the minority. 25% of the population is Tamil speaking but see how it is being reflected in the public service. This percentage is reducing daily. In addition 4% retire annually from the Public service. That is why we are trying to solve the language problem, particular in this transition period. 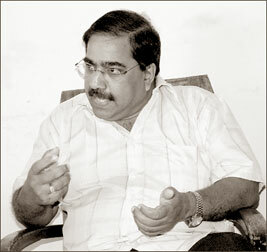 Suresh Premachandran: Unique to the minorities. 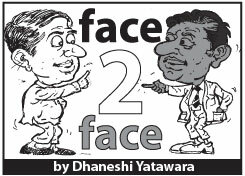 We agree even Sinhala people do face problems. But it is all due to corruption in the administration. Tamils are the majority among the minority. If the Government functions properly then there would be no such grievances. And why do we have to go as Sri Lankan Tamils, Sri Lankan Muslims. Why can not we call ourselves Sri Lankans? To what extent do you agree with the current proposal for a political solution? D.E.W. Gunasekera: It is only the 13th Amendment at present. President Rajapaksa appointed the All Party Representative Committee to find a solution and go beyond the 13th Amendment. The Government is emphasizing on immediate and interim solution until the APRC reaches to a final political solution. We must also note that LTTE have not only losing their territory but they are losing confidence of their own people. Suresh Premachandran: After 20 years the Government is trying to implement the 13th Amendment now, which does not meet the present needs of the Tamil populace. Several years have rolled by since then. Even a political student can say this is not enough. So I do not think that you can do anything. This is a political problem. I think the 13th Amendment is not the best route to solve the national issue.